Cube Steak With Green Chili Gravy And Noodles came about as experiment 102, because we passed experiment 101 a loooong time ago. I started with frozen cube steaks and frozen green chili, which meant I didn’t have the time for the usual meals I would have prepared with these ingredients and of course that means experiment time…can you hear the grumbling in the background from the family. I must admit that I was a little concerned about how my family would take to this experiment and it was met with MORE PLEASE! I will most certainly have to double this recipe from now on as everyone left the table wanting more. We served this meal with bread and butter to “fill in” because I could quickly tell that I was going to run out. On one hand that is nice because no leftovers to worry about but on the other that’s a bad thing, no leftovers for later in the week. Cube Steak With Green Chili Gravy And Noodles could easily be adapted to become a slow cooker meal as well. Combine everything except the noodles when you leave the house with your slow cooker on low and add your noodles 30 minutes before serving. If you have enough skillets ( I LOVE this skillet by Rachel Ray and use it daily) this would be a simple meal to turn into feeding a group. My husband’s birthday party is coming up soon and I think I found the dinner meal. 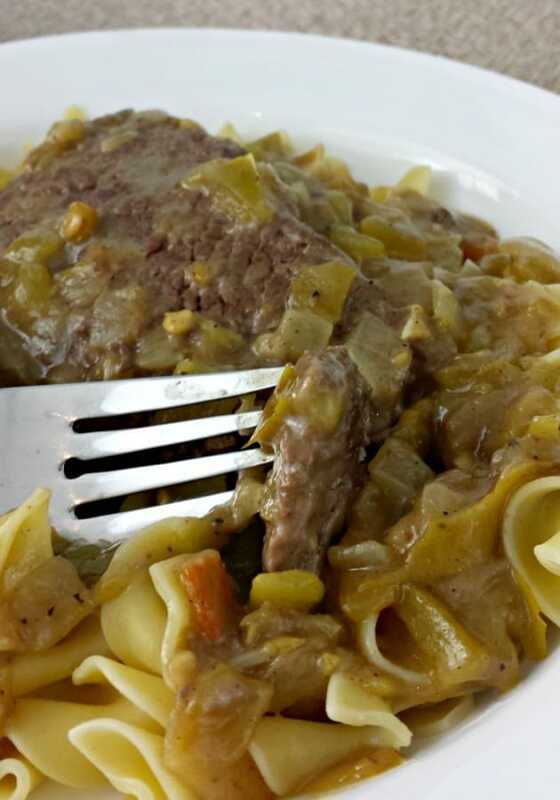 Place cube steaks, green chili, 1 cup water and beef bullion in skillet and let simmer for 35-40 minutes. Add dry egg noodles and 1 cup water to skillet and let simmer on medium for 15 minutes or until noodles are cooked thoroughly. When your pressed for time or left cooking with whatever is left, what is your go-to meal? 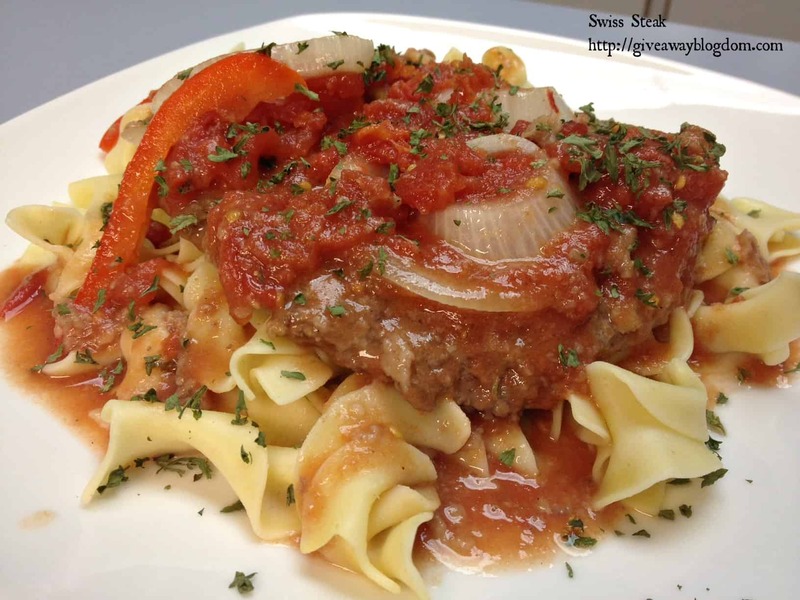 Do you have a favorite easy beef recipe? How do you prepare cube steaks? 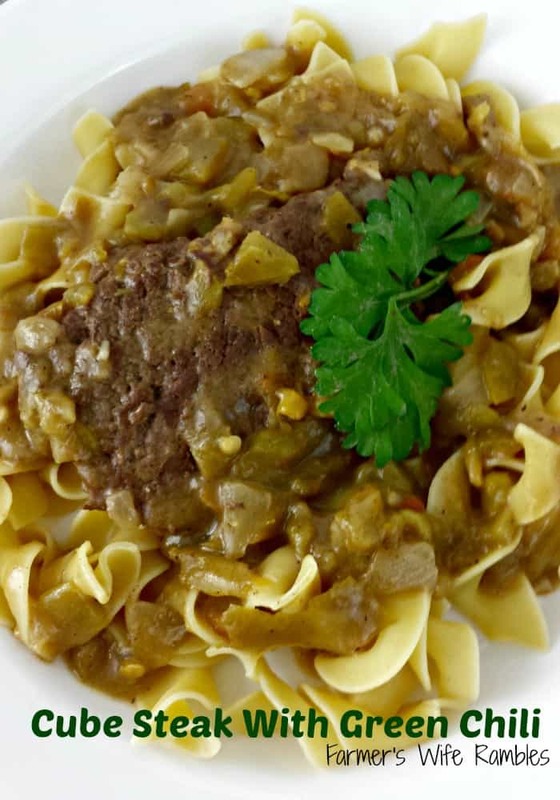 Cube Steak With Green Chili Gravy & Noodles sound good? Find more easy beef recipes and don’t forget the dinner sides and dessert! I love cube steak with egg noodles. Love when the gravey is smothered all over the noodles, so good. One of my hubbys favorite dishes. I make something really similiar minus the green chilis! It’s really good and super easy. Ya know, I think I have some cube steaks in the freezer because I wasn’t sure what to do with them. Now I can use them. I just need to get some egg noodles. Looks really good. I can’t wait to try it! We love cube steak and this sounds like the perfect recipe. Love that you are using noodles with it! This is an easy delicious and a recipe that I am going to make for my family. I like how easy it is to make, and we love noodles with meat on it. Thanks for sharing such a wonderful family recipe!